Communities, government and industry have all expressed interest in monitoring the cumulative impacts of oil and gas exploration activity and other natural factors on wildlife within the Sahtú region. The Cumulative Impacts Monitoring Program (CIMP) has provided funding to start a collaborative wildlife monitoring program entitled "Multi-species monitoring using winter wildlife track surveys in the Sahtú Settlement Region" that uses surveys of wildlife tracks in the snow to measure changes in abundance and distribution of species such as boreal woodland caribou, moose, wolves and other furbearers such as marten and lynx. Further funding was secured from the NWT Environmental Studies Research Fund to continue the program from 2017-2021. The territorial government, Sahtú Renewable Resources Board (Ɂehdzo Got'ı̨nę Gots'ę́ Nákedı), and Tulı́t’a and Norman Wells Renewable Resource Councils (Tulı́t'a Ɂehdzo Got'ı̨nę and Tłegǫ́hłı Renewable Resources Council) have been partners on this project. Explor also provided track survey data collected during their Tulita seismic survey program in 2012 and 2013. 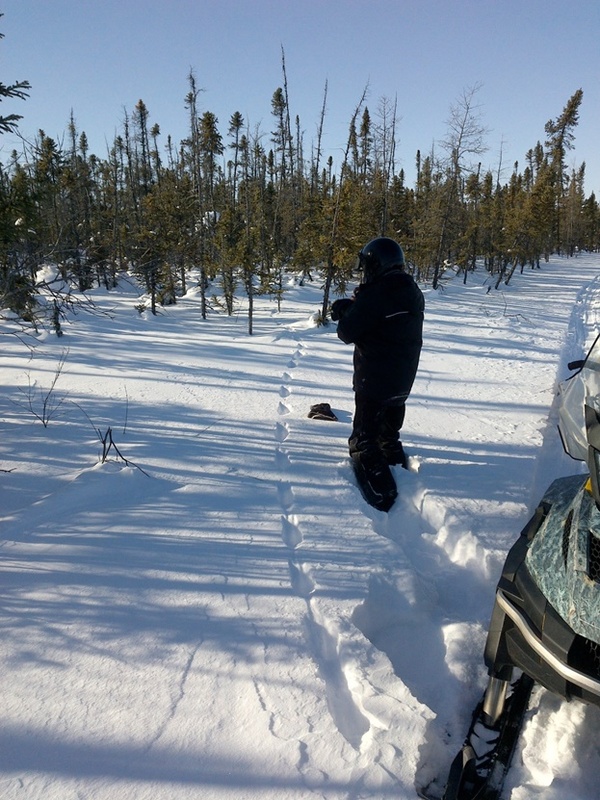 Track surveys are conducted by teams of youth and elders along trails and seismic lines around each community. A mobile data collection app (Trailmark) is used to record tracks on handheld computers using a series of standard questions, along with coordinates, photos and audio recordings associated with each track. This project will provide maps of where wildlife tracks are seen on the land, and information describing the habitat at each track observation. By repeating the surveys along the same trails and seismic lines over many years we will measure whether wildlife abundance and distribution is changing and if there is a link to the amount of industrial activity, forest fires and other human activity in different areas. This will help wildlife and land managers to understand the combined impacts of industrial development and natural disturbances and help to guide decisions about land use and wildlife harvesting. Tulita track surveyors: William Horassi, Jonathon Yakeleya, Philip Clement, Robert Horassi, Joanne Krutko, Dion Lennie, and Joseph Ayah; field work coordination provided by Roy Desjarlais.